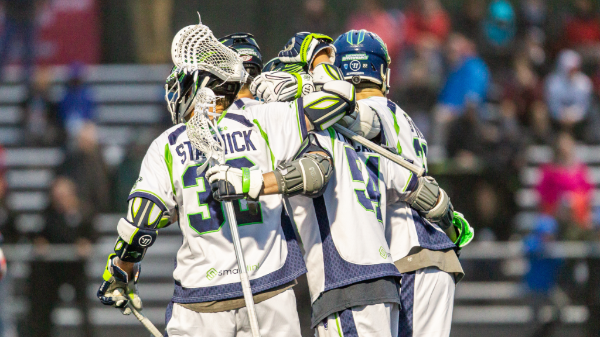 Photo courtesy of the Chesapeake Bayhawks. The Boston Cannons played another competitive game, yet came up short as they fell to the Chesapeake Bayhawks over the weekend. The Cannons held an 8-4 lead at the half thanks to scoring six goals in the second quarter. Boston’s offense went silent in the second half as Chesapeake’s offense soared, outscoring the Cannons 10-3. The win moves the Bayhawks into a three-way tie for third place while Boston remains in last place. Niko Amato made 13 saves in the Bayhawks’ win while Tyler Fiorito followed behind with 12 saves for the Cannons. Myles Jones led Chesapeake with five goals and James Pannell led Boston with four goals. Stephen Kelly won the faceoff battle for Chesapeake as he went 16-28. Up Next: Both teams get the week off as Chesapeake looks to move up while Boston tries to get back on track. The Denver Outlaws finally corralled the Charlotte Hounds as they handed the Hounds their first loss of the season. Denver jumped out to an early 7-1 lead in the first quarter and kept up the pressure in the second as they took an 8-4 lead into the half. The Hounds doggedly tried to cut into the lead as the Outlaws sat on top 12-7 at the end of the third. Despite Charlotte’s efforts, Denver held onto the lead for the win. Jack Kelly made 13 saves in Denver’s victory as Charlie Cipriano made fifteen15saves for Charlotte. Chris Cloutier led Denver in scoring in his MLL debut with eight points (6G/2A), for which he earned offensive player of the week honors with his performance. John Haus (2G/2A) and Kevin Cooper (3G/1A) lead Charlotte with four points each. Max Adler got the best of the faceoff battle as he went 24-34 for Denver. Up Next: Despite the loss, the Hounds remain in first and host Ohio next week as Denver has the week off to figure out a way to get out of eighth place. The Dallas Rattlers came back against a red-hot Atlanta Blaze squad to win in overtime. The Blaze took an early 5-2 lead in the first and extended that lead to 10-6 at halftime. The third quarter saw both teams score two goals each as the Blaze led 12-8. The Rattlers came to life and scored six goals in the fourth quarter to force overtime as Atlanta only scored twice in the period. Ryan McNamara scored the game winner off a Jordan Wolf assist for the Dallas victory. John Galloway made 13 saves for Dallas and got the win while Chris Madalon made 17 for Atlanta. Joel White earned defensive player of the week honors with two points (1G/1A), one caused turnover and six groundballs in the Dallas win. Randy Staats led the Rattlers with four points (3G/1A). Kevin Rice (2G/3A) and Tommy Palasek (4G/1A) led the Blaze with five points. Drew Simoneau continued a very successful season as he went 19-33 from the X. Up Next: Dallas travels down to Florida looking for the win to overtake first place Charlotte while Atlanta has the week off to regroup. The Florida Launch looked to get back on the winning track as the Launch took an early 2-0 lead over the New York Lizards in the first quarter. The Lizards roared back with five goals in the second quarter to narrow the Launch lead to 6-5 at the half. By the end of the third, the Launch still held the lead 10-8. The Lizards’ offense flexed their muscles and pumped out six goals in the fourth quarter to take a one-goal lead and seal a win over the home team. The loss drops Florida into a tie for fourth with New York. Drew Adams made 19 saves in the New York win while Austin Kaut made 12. Joe Walters led New York with five points (3G/2A). Kieran McArdle led Florida with six points (5G/1A). Ben Williams ruled the X going 19-29 and stabilizing the faceoff position for the Launch. Up Next: New York gets the week off and Florida hosts Dallas in a crucial game against the Rattlers who look for revenge against the team that swept them last season.